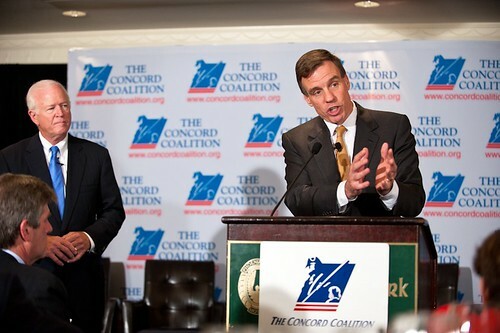 The nonpartisan Concord Coalition presented Senators Warner (D-VA) and Saxby Chambliss (R-GA) with its 2011 “Economic Patriots Award” for their efforts as co-founders of the Senate’s so-called “Gang of Six” to find bipartisan solutions to our nation’s fiscal and economic challenges. The award was presented by former U.S. Senator Sam Nunn (D-GA) at a ceremony in Washington on Wednesday night. In July, after seven months of bipartisan discussions, the Gang of Six unveiled a 10-year, $3.7 trillion debt reduction framework modeled on the work of the National Commission on Fiscal Responsibility and Reform. Since then, a combined 45 members of the Senate have endorsed the Gang of Six approach to deficit and debt reduction – an approach that includes spending cuts, tax and entitlement reforms. Yesterday, 100 members of the U.S. House of Representatives – 40 Republicans and 60 Democrats – also endorsed this bipartisan approach. “These two senators have demonstrated a strong commitment to fiscal responsibility, intergenerational equity and political civility,” said Bob Kerrey, a co-chairman of Concord and former Democratic U.S. Senator from Nebraska. "If more elected officials were to follow their example, the country would be in a much better position and younger generations could look toward the future with greater confidence and peace of mind." Warren B. Rudman, a Concord co-chairman and former Republican U.S. Senator from New Hampshire, said Warner and Chambliss were recognized because of their leadership in putting forward tough budget proposals designed to win support from both parties. “The leadership of the ‘Gang of Six’ this year by Senators Chambliss and Warner stands as a model of bipartisan cooperation and compromise in confronting the difficult choices that we know are necessary to set our nation on a better course,” Rudman said. The Concord Coalition’s Economic Patriot Award recognizes leaders who have demonstrated a commitment to fiscal integrity and generational responsibility. Through the years, the Economic Patriot Award has been given to individuals from the business world or government and politics who have made lasting contributions to America's economic health. Founded in 1992, the Concord Coalition is a nonpartisan, grassroots organization dedicated to educating the public about the causes and consequences of federal budget deficits, the long-term challenges facing America's unsustainable entitlement programs, and how to build a sound foundation for economic growth.